We're in the thick of loquat season here in Berkeley. Many of the loquat trees are so laden with these exotic orange fruits that they look as if they might actually topple over. 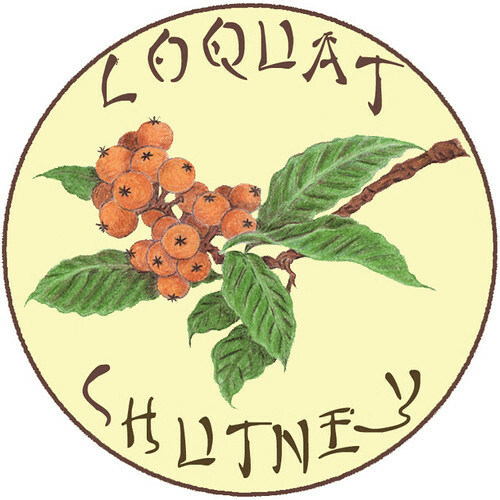 Since I lived on the east coast for 29 years without ever once encountering a loquat tree, I realize that many of you may be wondering what on earth a loquat is... If so, loquats are a delicious fruit that are native to southeastern China but that also seem to flourish here in California. They have a juicy flesh that is somewhat firm and very sweet. Their flavor is hard to describe but I personally think it falls somewhere between an apple and an apricot, if you can imagine that. Each fruit contains two big, beautiful seeds that look like little balls of polished wood). 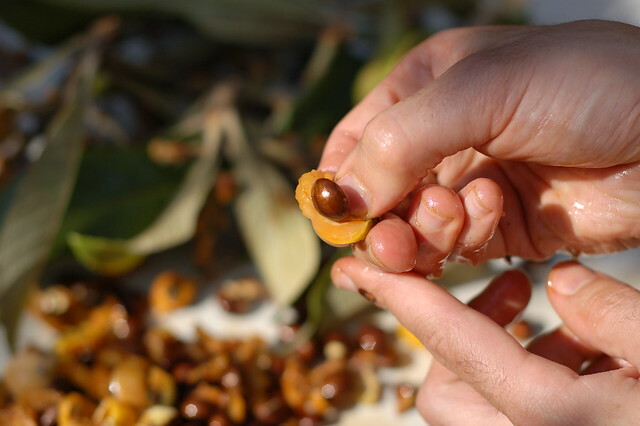 Although it is extremely easy to forage for loquats here in North Berkeley, my brother and his family actually have a big loquat tree growing behind their house which makes it even easier to pick them. 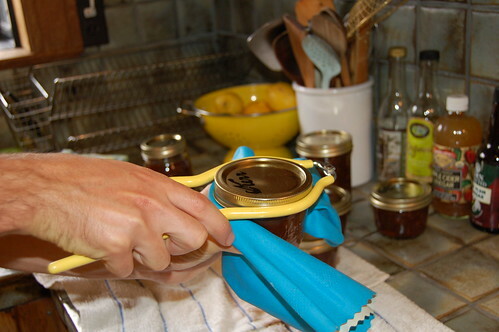 We recently got together to make a big batch of loquat chutney. The fruits are a perfect choice for this spicy, sweet treat. My adorable niece Lila helped pick the loquats and did her share of eating the fruits, too, as her sticky little face can attest. The seeds do make this task a bit more time-consuming but many hands will make the work go quickly so this is a good thing to do with friends. 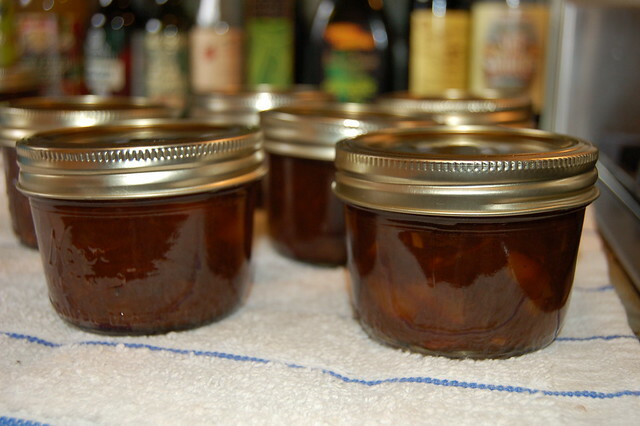 I recommend making a big batch and canning it since a jar of loquat chutney makes a very nice gift. I made a special label for my jars (move over Martha...) which you can see below and are also welcome to use for your own jars if you like. 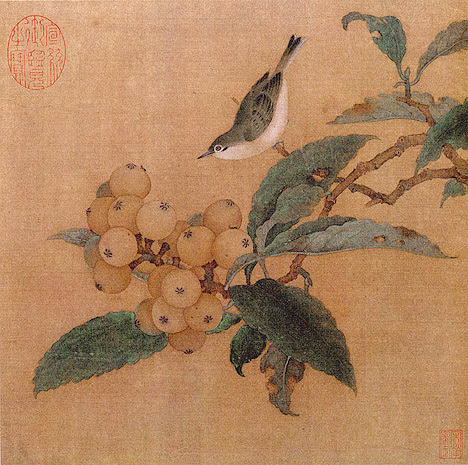 I took my inspiration from a beautiful Chinese painting of a loquat tree and bird from the time of the Song Dynasty (though my version is done in colored pencil.) For more detailed instructions on how to can foods, check out my little tutorial. 1. Put all the ingredients in a large pot and bring to a boil. 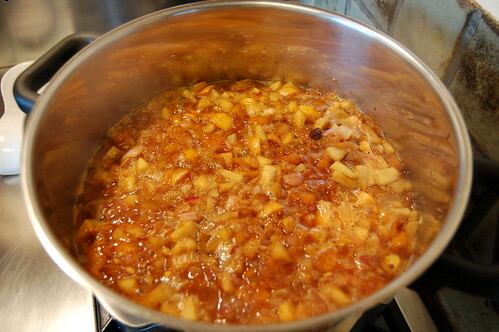 Cook gently until soft and a good color, about 1 - 1 1/2 hours, stirring regularly to prevent the chutney from sticking or burning. 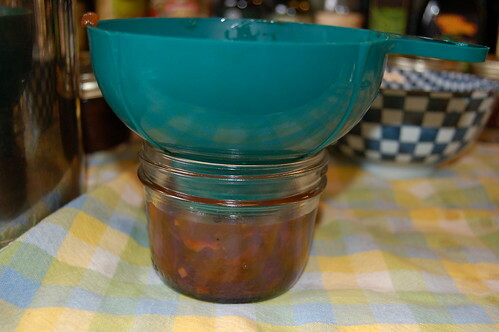 Pour the hot chutney into the hot jars, being sure to leave half an inch of headroom in each jar. Drop the sterilized lids on, cover with the rings and tighten until well closed. 3. Process the sealed jars for 10 minutes in a boiling water bath. 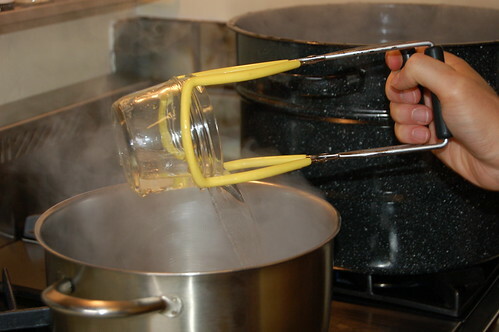 Remove the jars from the boiling water bath and let cool in a draft-free place overnight. Check the lids to make sure they've popped down to ensure they're properly sealed (I love the sound the jars make as they seal.) If any of the lids have not sealed properly, refrigerate those jars and use them right away. The rest can be stored in a cool dark place for 9 months. This chutney is a nice accompaniment to roasted meats, lamb burgers, kabobs of all kinds, Indian food, vegetable fritters, and many more things. Sounds delicious. Loquats bring me back to my days in Berkeley. Enjoyed this post Eve. I've never had a loquat, it's nice to get introduced. I have a huge amount of apricots sitting on my kitchen counter that have been waiting for me to make them into jam. Since apricots are calling my name, and I don't know where to get loquats in Sacramento, I'll try your chutney recipe and substitute apricots! Sounds scrumptious. I'll have to see if Whole Foods have any. I haven't eaten on fresh since my best friend & hubbie lived in Berkely while he was at U of C. Loved visiting. A zest fourth weekend to you!!! I love how Lila is in the spokemodel stance...too cute!!! 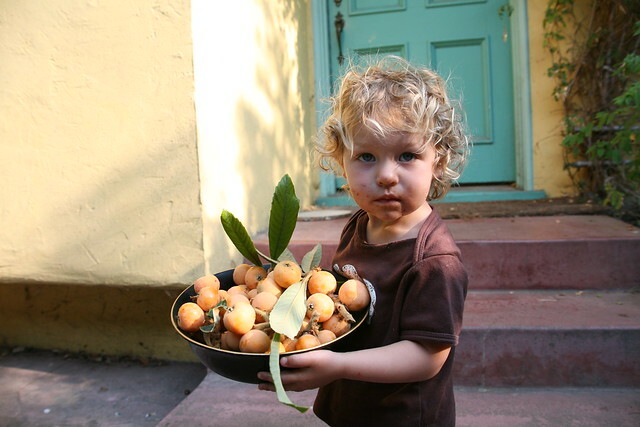 What a lovely loquat photo of little Lila. She's just scrumptious. We have a loquat tree in our backyard that has a ton of fruit. We made 3 batches of your chutney. It is FABULOUS!! Thank you for sharing the recipe! Did you peel the loquats? Hi Emma, it is an astounding amount of sugar, isn't it? I'm sure you could cut it down some but you need to keep in mind that sugar is part of what preserves the food so you'd probably want to eat it in the short term and not save it for months and months. Ahhh, I see :) I actually didn't think of sugar as the preservative since this is a new endeavor for me. Thank you so much for the guidance - I think I'll just make it like the expert advises instead of testing my inexperience with such a labor intensive fruit! What is the yield? How many half pint or pint jars are needed? I'm just curious about the origin of the recipe and whether you pH test? Thanks! Firstly thanks for posting this recipe... Made chutney three days ago and the result tastes good but the vinegar Favour is quite overpowering... Not sure if that's how chutney is supposed to taste. Which leads me to the "useful" comment, I don't think that the sugar can be cut because it balances the vinegar, otherwise it would be really strong. And my question: do you make the measures in the recipe as unprepared fruit (with skin and seeds/core) or is it the fruit flesh weight? Also was wondering if you use brown or yellow mustard seeds, I only had brown, so I used those. Great recipe! I cut the sugar to 1 1/2 cups, added extra raisins and some cayenne pepper. Made 2 batches! Plan to give as gifts to friends with a sophisticated palate! Anoynymous, great idea about the cayenne! So glad to hear it. I also gave a bunch of my yield away as gifts (hence the purty label) and it was well received. Virginia, sorry for the slow response - the measure is of pitted fruit (no need to peel them, though). I did not have the overpowering vinegar issue. Perhaps it needed to cook a bit longer? The mustard seeds I used were brown, I believe. Eve,I've been making Loquat chutney for a few years, as I have some huge trees. This year is a bumper crop of huge fruit. I am very excited and tried to pick as much as I could before the birds get them all. The only difference in my recipe is that I also add julienne strips of dried apricots. 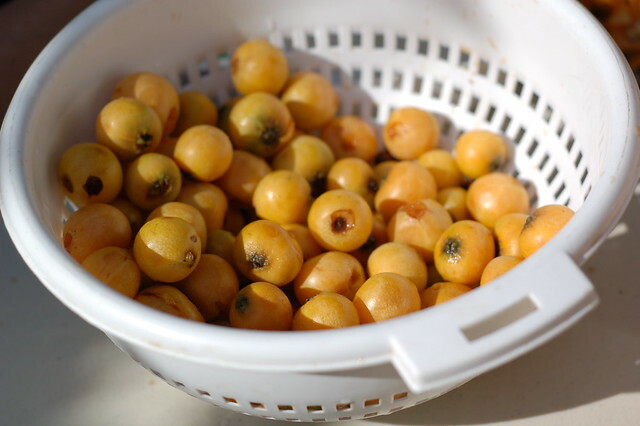 I live in Austin, and my neighbors come and pick loquats as soon as I have enough for several batches. If I can figure out how to send a pic, I will. Catherine, "older lady chutney maker"
p.s. I have never seen loquats in stores including whole foods or Central Mkt. pss. You might tell your readers not to freak out when their fingers turn brown from the fruit, it does come off with soap and water after a couple of days. Yikes. Good point about the brown fingers - I'd forgotten about that, Catherine. Lucky lady to have your own tree! Hi Eve, it is me again, Catherine. We harvested so many loquats. Ended up with 27 cups of fruit that made 9 pints of chutney. It turned out really delicious. Yes my fingers are still stained. Eve, The mustard in the recipe...is that prepared yellow, or some other type prepared, or dry? Also, my loquats are fairly small, do you have a good estimate of measured, prepared fruit? I can wing it, but always like to make a recipe as written before playing around with it. Thank you! The mustard in this recipe-is it prepared yellow, some other kind of prepared, or dry? Also, my fruit is fairly small, do you have an estimate of the amt. of prepared fruit? Thank you! Hi there, there is both prepared mustard and mustard seed in the recipe. To be honest, I think it's a pretty flexible recipe so you could use any kind of prepared mustard (and you could probably also use powdered instead though perhaps use half as much) and I think you could use either brown or yellow dried mustard seed. Just taste as you go! This is just about flavor so there's no need to be worried about amounts for preserving purposes. Eve, this is a lovely recipe. I'm going to attempt it on the weekend. I've got a bumper crop of loquats this year, from our three trees, however they are a lot smaller than your lovely looking ones. I am SO GLAD you said not to peel them...phew! I made jelly preserve last week from them and it's delicious! Thanks so much, Lucy. Lucky you to have so many trees! I envy you your bumper crop. Hope you like the chutney. Loquats grow all over central and south Florida.. We compete with the birds and squirrels. Many have the trees but don't bother eating the fruit, so I have free rein to go pick all I want from 4 trees (all over 25 foot tall) in the neighboring 4 yards.. Kids in the neighborhood decided to 'steal' some of the fruit; the homeowners handed them bags and told them to take all they wanted and showed them about the seeds (3 seeds in ours here). We get sometimes two rounds of fruit a year here. Donna, you are very lucky!!! We live in Houston, Tx. 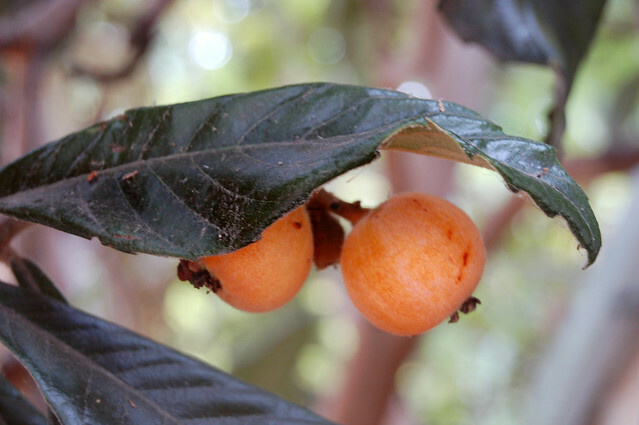 We discovered that we have two loquat trees laden with fruit on the grounds of our workplace. We picked a gallon yesterday before work. I've been sharing bags with co-workers and I plan to make chutney this weekend. Hope it turns out well for you. I used regular old granulated cane sugar. Made this recipe last year and my friends were mugging me for chutney. Just picked loquats from the tree in our orchard and now have another batch bubbling away on the stove. We love it on cold meat sandwiches and with cheese platters. Glad I found your recipe as I jam, preserve and can anything that comes my way. Have printed off a few of your labels this time. Make them look good.